For the monotypic genus Ricola, see Ricola macrops. Ricola Ltd./Ricola AG is a Swiss manufacturer of cough drops and breath mints. All their products include natural herbal ingredients exclusively cultivated on Swiss soil without any use of pesticides, insecticides or herbicides. The head office of Ricola is located in Laufen, Basel-Country. Ricola listed sales of 297.3 million of Swiss francs in (2012) and employs 400 workers. Around 200 independent produce companies in the surrounding area service Ricola. In order to obtain enough herbs for the production of its herbal drops, the firm contracts over 100 self-managed farms in the Valais, Emmental, Val Poschiavo and at the southern foot of the Jura Mountains, in central Switzerland, and in Ticino. Ricola is known for its commercials featuring Heidi (Ramona Pringle) depicting mountaineers shouting "Ri-co-la!" and blowing through a large Alphorn. Ricola began in 1930 when Emil Wilhelm Richterich and Daniel Ruoss Sr. established Confiseriefabrik Richterich & Co. Laufen after the purchase of a small bakery in Laufen, just outside Basel. Under Richterich, the bakery specialized in confectionery such as “Fünfermocken," a sweet which was similar to caramel. In 1940 Richterich created Ricola's Swiss Herbal Sweet incorporating a blend of 13 herbs. In the 1950s the sweet became appreciated for its ability to be dissolved in boiling water, creating an aromatic herbal tea or tisane, which inspired Richterich to create a Ricola Herbal Tea a few years later. In 1967, Emil Richterich and his sons Hans Peter and Alfred renamed the company Ricola, an abbreviation of Richterich & Compagnie Laufen. Export began in the 1970s, introducing Ricola's products to foreign markets. At the end of the decade, Ricola moved to a new purpose-built factory in the vicinity of Laufen, where its headquarters are still located. In 1976, after extensive research on sugar-free confectionery, Ricola launched Switzerland’s first chewable, sugarless herbal sweet. Ricola first started to advertise its products on television in the 1980s, an era that saw increased awareness of the need for good dental hygiene, increasing the demand for sugar-free products such as the ones that Ricola offered. In 1988 the company started packaging their products in small boxes. The company is now managed by Felix Richterich, son of Hans Peter and grandson of the founder. Today, Ricola exports to over 50 countries in Asia, North America and Europe. In the United States, ten herbs make up the herbal mixture, three of which are not in the above list. These are Linden Flowers (Tilia platyphyllos), Wild Thyme (Thymus serpyllum) and Hyssop (Hyssopus officinalis). The herbs used to produce Ricola's cough drops are not cultivated in these gardens, but in natural plantations in the Swiss mountains in accordance with strict organic or BioSuisse guidelines. Ricola ensures that its cultivation areas are not situated near industrial sites or the road networks to avoid contact with harmful pollutants. Over 100 self-managed farms are under contract to Ricola in the Valais, Emmental, Puschlav and the Jura Mountains, in Central Switzerland and Ticino. No pesticides, insecticides or herbicides are used in herb cultivation. ^ "Products". Ricola AG. Retrieved 2015-12-02. ^ a b "Ricola herb farmers would rather inspect every single leaf individually than use chemical substances to combat insects or other pests". Ricola AG. Retrieved 2015-12-02. ^ "Contact". Ricola AG. Retrieved 2015-12-02. ^ a b c "History". Ricola AG. Retrieved 2015-12-02. ^ "The Company". Ricola AG. Retrieved 2015-12-02. ^ "The Magic 13 Herbs". Ricola AG. Retrieved 2015-12-02. ^ "Ricola Original – Ingredients". Ricola. Retrieved 2015-12-06. ^ "Ricola Herb Gardens". Ricola AG. Retrieved 2015-12-02. ^ "Ricola is among the top 20 Swiss brands". Ricola AG. Retrieved 2015-12-02. 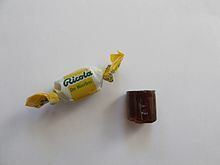 Wikimedia Commons has media related to Ricola. This page was last edited on 7 March 2019, at 14:46 (UTC).